Another Beautiful Day in Paradise. The temperature started off in the 60's and was in the 70's by the end of the skate. We had a beautiful clear blue sky with a slight East breeze. Absentees Gerald, Cindy S, Mike Mas. and Rick & Ginnie came. Welcome back. 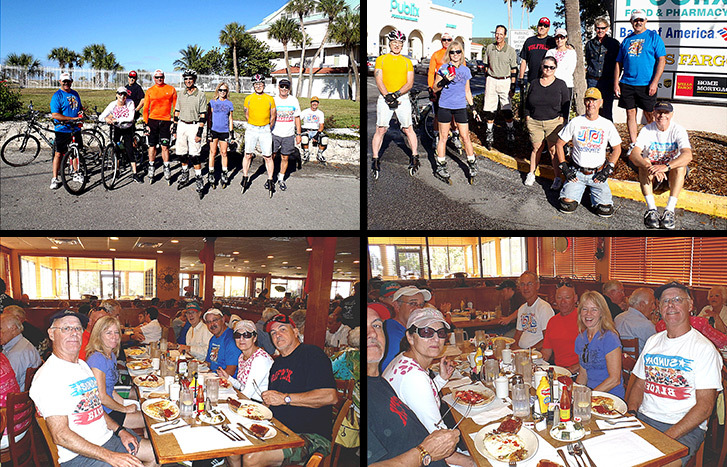 We did our usual Clearwater Beach route. Andrew and Maggie dropped out as we headed to the Clearwater bridge. Hopefully they only had a flat or something minor. We also had a little problem getting Cindy S to stop going up and down the Clearwater bridge. She said she just loved it. Rick got 11.5 miles and I got 10.5 miles so we'll give the distance 11 miles. We missed having Dee's GPS millage. Hope Dee is recovering nicely from his minor operation. We had 6 bicyclists. We brunched at Georgie Boy Restaurant as planned. They got us in, in just a few minutes even though I under estimated the number coming. It took them a while to get the coffee flowing but they finally did. They were packed so it took us a little over an hour to get in and out. Someone in the group had left their cell phone at Iara's Party so she joined us to bring the phone. Thanks Iara. Rob rated his Brunch a 9.5.